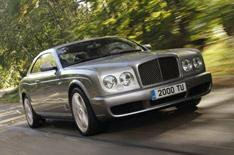 First drive: Bentley Brooklands | What Car? Bentley is only ever going to make 550 examples of its rather delicious-looking £230,000, 530bhp, 184mph Brooklands coupe, but don't beat yourself up about not being able to afford one. You see, even today, three years before the last and final model will roll off the production line at Crewe, over 500 cars have already found homes, so it's unlikely you could ever buy one anyway. That means the Brooklands will still go down in history as one of VW's, sorry, Bentley's most successful cars. Everything about the Brooklands is big, and, by and large, beautiful. Its twin-turbo 6.75-litre V8 is the most potent V8 in current production, boasting not only 530bhp but also a whopping 774lb ft of pull. The optional carbon ceramic brakes (add £14,000 to the bill, please, Jeeves) are the largest of any production car. Even the rear passenger compartment is, according to Bentley, the most spacious of any two-door coupe's in history. Although you get some idea of the size of the Brooklands in photos, nothing can prepare you for its proportions when you encounter it on the road, among everyday traffic. Yet despite its monstrous 10ft wheelbase and 17ft overall length, it still looks lithe and athletic - graceful even, and you can quite clearly detect the influence of the 1957 S-Series Continental in its styling. Before you so much as turn the key or press the starter button, it's best to savour what surrounds you in a Bentley Brooklands. Swathes of beautifully hand-stitched leather and acres of wood and stainless steel seemingly cover every surface. After 10 minutes inside this car, you start to wonder whether it might be the most beautiful thing you've ever sat in. On the road, the Brooklands has so much pulling power it matters not one iota that the ancient V8 won't rev much beyond 4500rpm, because at that point you're already flying at the horizon as if on board a leather-lined jet fighter. The acceleration is as potent as it is hilarious, and the first time you experience it, all you want to do is come back for more. As you'd expect, the ride is super-smooth, but has enough detail in its response to let you know exactly what's going on beneath your backside. Even the steering feels sharp enough to allow you to place the nose accurately through quick bends without too much body roll to lob you off-line. The real star of the show is the engine, though - and the gearbox, which works seamlessly in tune with the motor to provide one of the more surreal experiences you'll ever have in a motor car. Think Porsche 911-style acceleration but with almost no drama, and no perception of speed other than the scenery rushing quietly past the window, and you might get an inkling of what a Brooklands feels like to drive. Oh yes, and it does about 14 miles to the gallon - on a good day. Ouch.